The only thing better than having a great local dentist is having a dental practice that loves living in and working with their community. Dr. Joe Isaacson and his practice take great pride in living in Oklahoma City as well as helping patients improve their oral and overall health. Keep reading to learn more about your dentist in OKC and why he loves practicing quality care in the city of Thunder. 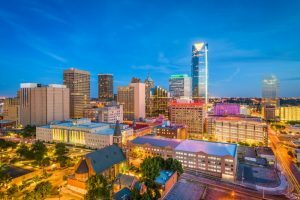 Dr. Isaacson has developed a strong connection with Oklahoma City after serving patients in the community for over 2 decades. His love affair with the area started when he attended Oklahoma State University for an undergraduate degree. He then completed his dental degree at the University of Oklahoma. While some may question his choice of attending rival schools, he likes to think that he was able to experience 2 of the country’s best universities. He has also received the Best of Oklahoma City Award from the United States Commerce Association, recognizing him for the amazing and quality dental care that he provides. If you’re a fan of the Thunder, you may run into Dr. Isaacson at the Chesapeake Arena rooting on his team. He loves watching Russell Westbrook rack up triple-doubles as well as the overall energy that the Oklahoma City community brings to the arena. You may also find him in Bricktown, enjoying the many foods and drinks that the heart of OKC dining has to offer. If you see him around, say hi! He loves interacting with his patients to see them smile in and outside of his office. Another activity that Dr. Isaacson enjoys is attending the Oklahoma City Memorial & Museum. This beautiful, one-of-a-kind memorial remembers the tragedy that the city faced decades ago, while offering the community an amazing display of artistic ability. Dr. Isaacson is conveniently located in Northwest Oklahoma City, close to Lake Hefner. His office is also near Guilchester Park and the Oklahoma City Golf & Country club, making his practice a prime destination. Many families visit the practice to receive quality dental care, and then finish out their day with some time at the lake or at 1 of the 4 parks in the surrounding area. Does it sound like you found your new dentist in Oklahoma City? Contact Dr. Isaacson to get started on quality dental care with someone that loves his community. Dr. Joe Isaacson is an experienced dentist with a passion for helping his patients. He takes great pride in the city that he calls home, which is why he wants you to know more about is involvement in his community. For any questions, he can be contacted through his website or by phone at (405) 943-8575.